After posting this to Twitter and Facebook last week I was contacted and told that an agent would get in touch. Eventually that happened and they have told me that they’ve sent £140 by cheque, but without admitting explicitly that anything was wrong, nor giving any clearer assurance about what we should do in the future. Executive summary and why all families should be worried about travelling with BA: British Airways do not always honour the extra children’s car seat / stroller allowances that they quote on their website; sometimes you may be charged for every car seat as excess piece of luggage and other times not. Do not believe their website; their customer service refuse to honour it. Disclaimer: I don’t like having to write this post, but it seems important for others that it be written so that they can be warned. We flew from Belfast City Airport to Abuja, Nigeria, via London Heathrow on Sunday 19 January 2014. My wife and I were travelling with 2 children and an infant. The infant was allowed one extra hold bag in addition to the standard 3 bags paid for on our charity fare booked by Key Travel. So our total allowance of checked bags was to be 13. We had 2 booster child seats for the children (age 3 and 5, so required by law to travel to the airport in those seats) which are allowed as extra items, and a car seat for the infant and a push-chair. BA policy published on their website allows the car seats and push chair to be taken as extra hold items (without charge). However when we were about to arrange this at the checkin desk, the staff member told us that we would have to pay separately for all the 3 car seats. The staff member said that she was unable to check the car seats through without paying extra. I asked for a supervisor and she was unwilling or unable to contact one, since she didn’t actually work for BA but for another company. 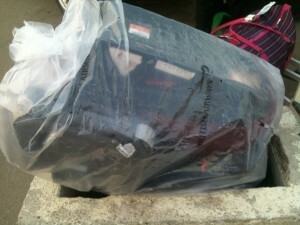 Car seats had to be wrapped up in a rather expensive £140 plastic bag. Understandably we were unhappy about this, but no option was presented to us except putting the car seats in a bag and paying £140 for it as an extra case, and taking part of one car seat as carry-on hand baggage. The agents (“Siobhan” and another colleague) were unwilling even to write a note explaining what they had insisted and the reasoning behind the withdrawal of the child seat allowance. This at the time seemed suspicious to me, but there seemed no way to force their hand. Our ‘Manage my booking’ details and the BA economy allowances policy available online makes it clear that child and infant tickets include an allowance for taking a car seat/booster seat and a stroller for each child/infant. The staff were unwilling to listen to reason and purported to have their hands tied. This has never been a problem for us before travelling in and out of Glasgow International Airport, Belfast International Airport, London Heathrow and Abuja International Airport where the child seat allowance has always been honoured. Firstly, I would like to apologise for the delay in replying to you. I am sorry to learn that Mr Rowbory and his family had an unpleasant experience at Belfast airport when checking in their baggage. I have checked our records and can confirm that the car seats that Mr Rowbory wanted to carry as a free checked baggage was in excess of his maximum allowance. Mr Rowbory was charged correctly. As stated in our previous response, Mr David Rowbory and his family had carried 15 pieces of checked luggage including the car seats. The car seats were in excess of the total checked baggage allowance. Hence, Mr Rowbory was not allowed to carry the car seats as a free checked luggage. This means that BA do not consider the children’s and infants’ allowances (3 items) to actually be free. You will note that 13 items were paid for on the tickets and the extra 2 were easily within the total of 3 seats + 3 strollers quoted on the baggage website. I wrote to customer services because I could see that it was important not just for us but for every other family to see whether BA would honour their stated extra allowances for children. Our conclusion is that sometimes a car seat (as with RyanAir) counts against our allowance as an item of hold baggage, but other times it does not (as with most airlines, including EasyJet). With BA you cannot be sure. Part of the problem may come from the way BA has contracted out so much of its operation. It would appear that the Belfast City checkin staff didn’t know anything about BA policy, nor did they care about customer service. The customer service staff seem to know nothing about the website. 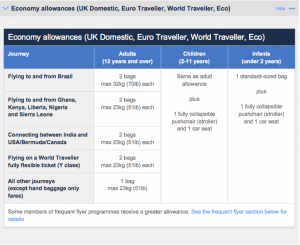 Before you travel with BA with a family you should probably write to customer services (maybe 3 months ahead of time, given their response rate) to find out whether or not you can take car seats for free in addition to other baggage allowance. This is the plain reading of their terms and conditions but not the practice this last time (though every other time we travelled it has been that way). Alternatively it may be financially safer to travel with almost any other long-haul carrier. Please do spread this news so that others are suitably warned. Feel free to contact us if you have any queries or would like more details.